Last week, our friends at Walt Disney World invited us out to Typhoon Lagoon to experience the water park for the day and attend the new H2O Glow Nights event! Before the park shenanigans began, the team at Disney Water Parks introduced us to the general manager of the parks, Mark Dukes as well as Chef Hal, creator and contributor of the special Glow Nights dining options available exclusively during the event. There's only a few opportunities left to grab your tickets for H2O Glow Nights, with only select dates running until August 11, 2018. The great news is that Mark says that there's a good chance that the event will make a return next year and hopefully with even more unique food and drink options! 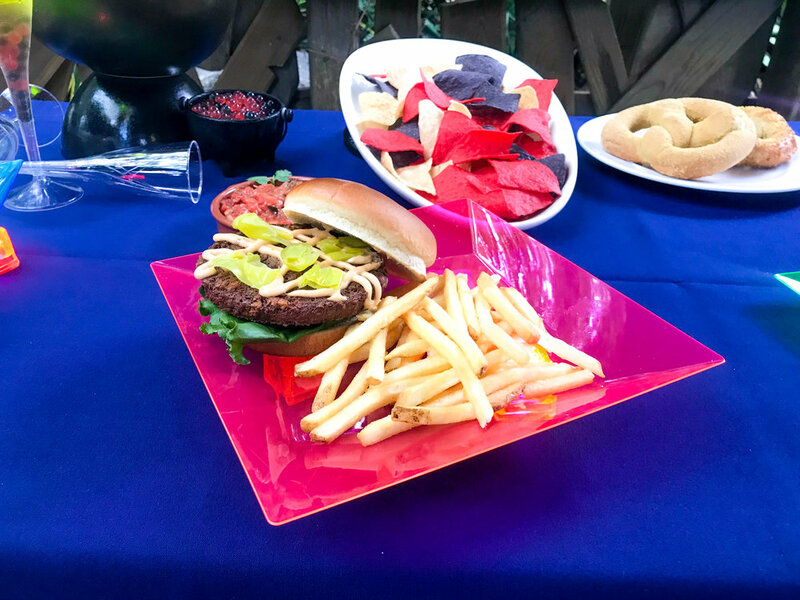 During this pre-screening of the event, we also had a chance to preview some of the food options that they have for H2O Glow Nights including a very big highlight of the event, a vegan Impossible Burger (perfect for Carise) as well as their new Strawberry Lemonade and Blue Raspberry slushies. Once the sun set, the fun really lit up the night! Here are some of the reasons why H2O Glow Nights is the perfect way to nightcap your Walt Disney World vacation! These events are limited to a small number of people meaning that the water park is nice and empty. Have fun jumping on Crush and Gusher, Misadventure Falls, and other fan favorites over and over again with no wait at all! Plus, some of the water rides glow as you float through them. You're going to flip when you see this water park transform from day to night. The disco lights turn on, music starts thumping, and Rex gets on stage as the DJ keeps cranking the tunes. This makes you feel like the party has really started and it's hard not to start dancing! On top of that, this area of the party has a fun water balloon toss and more to entertain the masses. The Impossible Burger isn't the only exclusive H2O Glow Nights food item! You can enjoy options like an Adobo Chicken Bowl, a Pork Belly Cubano Sandwich, a Salmon dish, and more. Plus, drinks will light up the night with Fred's Purple Siren an alcoholic relative to the fun drink offered at Pandora in Animal Kingdom, Black Light Cherry Lemonade, and more! From an American eagle to a rubber duck, Typhoon has loaded the lazy river with all kinds of unique floats for you to play on. This is an exciting addition to the water park that just makes this event all the more fun. There's even one that lights up! If you're taking a break from the little ones and the party music, slow it down in the adults only area over by The Wharf. There's some drink options, hula hoops, and some cool island music to keep it calm. We had so much fun at this event that we decided to take advantage of the annual pass discount (it brings it down to about $45/person) and attend once more for Steve's birthday celebration! Normal tickets are $55+tax - a tad bit cheaper than a regular park ticket at $65/person and you'll probably get more fun out of this experience than you will during the day. As we stated before, tickets for this event are only running from select dates until August 11th, so we suggest you run over to the Walt Disney World website to book your tickets now! We want to thank our friends at Walt Disney World for inviting us out to experience H2O Glow Nights and we think this is yet another win for an "after hours" experience at Disney! We can't wait to see what other fun events are on the radar in the future. For more information about Typhoon Lagoon's H2O Glow Nights, click here. Want to follow us on even more Foxy adventures? Follow along on Instagram to see live coverage of the events we attend!